Eding Sport FC of the Lekie have won the 59th edition of the National Challenge Cup of Cameron. The Yaoundé outfit edged Lion Blesse FC of Foutouni 1-0 yesterday in the final at the Ahmadou Ahidjo Stadium in Yaoundé. 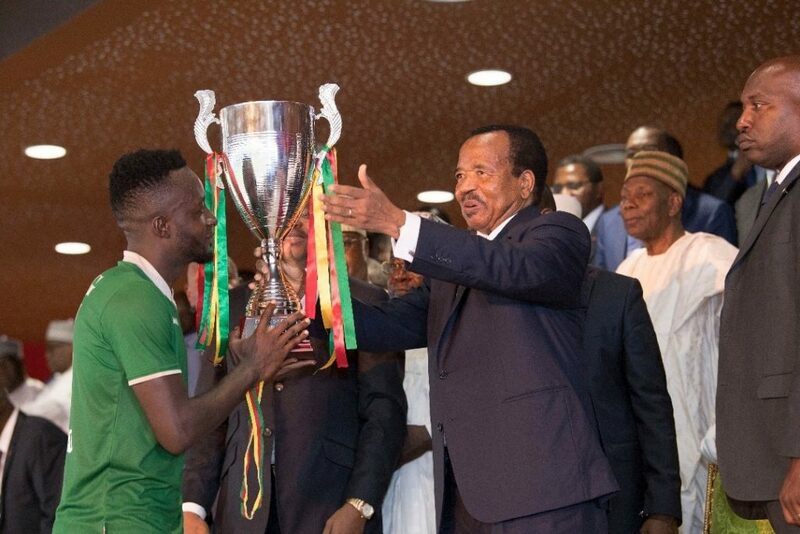 The 2018 Cup final was precided over by HE Paul Biya, President of the republic of Cameroon and officially marked the end of the 2017/2018 Sport Season. The lone goal of the encounter was scored during the first half of play after the a defensive error from Lion Blesse who had nursed hopes of a Cup title this year. Eding Sport of the Lekie have become a veritable force to reckon with when football in Cameroon is concerned. Despite their Cup victory, Eding FC won’t participate in the CAF Confederations Cup after Cameroon’s place was withdrawn by the Confederation of African Football ,CAF. In the last 3 season, the winners of the Cup of Cameroon have been clubs who took out the defending champions during the eliminatory phase of the competition. Eding Sport of the Lekie was created in 2012 and rose to the first division championship in 2015. Two years later the Saint Fabien Mvogo’a side clinch the Championship trophy in 2017. Their recent cup win adds to their silver wear 6years after creation.